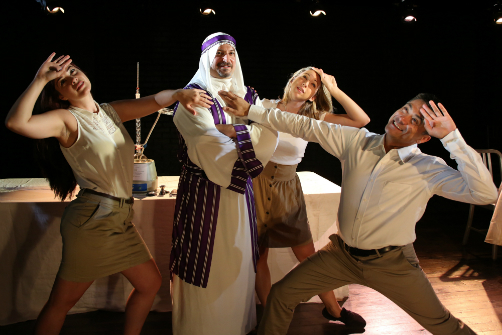 Ruthellen Cheney, Anthony Caporale, Nicole DiMattei, and Ariel Estrada in The Imbible- A Spirited History of Drinking. Photo by Dixie Sheridan. BOTTOM LINE: A factual journey of drinking throughout history. A solo show, but with backup singers. Anthony Caporale plays The Bartender in this amazing history lesson. Actually, it's more like a history class combined with a chemistry lesson that just happens to take place during music class. Backup singers and assistants (The Backwaiters: Nicole DiMattei, Ruthellen Cheney, and Ariel Estrada) supplement the entertainment to make the lecture fun. Keep in mind, when I use the term “lecture” I am not referring to a college class during which you fall asleep. What I am referring to is a knowledgeable educator at the top of his field where you want to sit in the front row and constantly scribble down notes. Starting at the time of hunters and gatherers, Caporale narrates historic events as The Backwaiters use props, miming, and music to demonstrate. From yeast, fermentation, and Einstein to formulas and the agricultural revolution, questions are asked of the audience keeping with the interactive classroom theme. Information from around the globe and the history of wine, cider, beer, etc. is shared. Luckily there is no test at the end of the show since a whole lot of information is fit into such a short amount of time. Between subjects and switching eras, the actors perform as a barbershop quartet. Though there are solos, the sweetest sounds are heard when the voices combine to form silk caressing your ears. Only those who are 21 and over are invited to attend this show. Alcoholic beverages are served throughout the production. Caporale is an extremely talented mixologist and raconteur. The tales he spins are all based in facts -- many of which I was not aware of -- and keep you yearning for more. Not everyone wants a history lesson, but this is oh so much more as Caporale dazzles you with his wit and crescendos.